Investigators also said at their Tuesday briefing that two flight attendants were ejected from the back of the Boeing 777 after impact and survived. 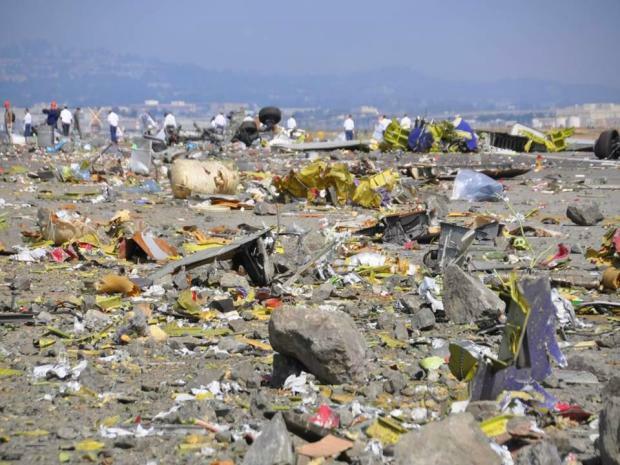 The pilots of Asiana Flight 214 relied on automated cockpit equipment to control the jetliner's speed as they landed at San Francisco airport, but realized too late they were flying too low and too slow before the aircraft crashed, investigators said Tuesday. One of the most puzzling aspects of the crash has been why the wide-body Boeing 777 jet came in far too low and slow, clipping its landing gear and then its tail on a rocky seawall just short of the runway. The crash killed two of the 307 people and injured scores of others, most not seriously. 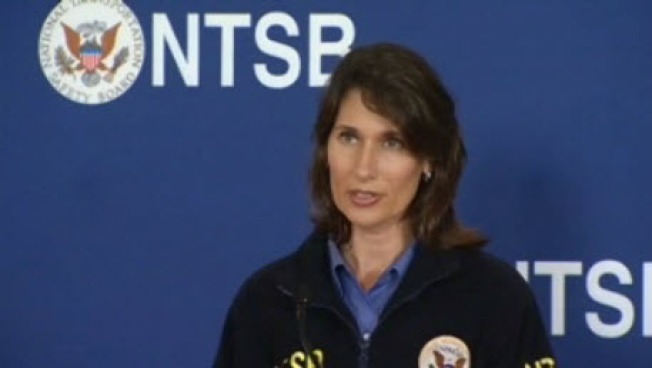 National Transportation Safety Board chairman Deborah Hersman said the training captain who was instructing the pilot flying the aircraft has told investigators he thought the autothrottle, similar to a car's cruise control, was programed for a speed of 137 knots — the target speed the pilots had selected for how fast they wanted the plane to be flying when it crossed the runway threshold. Instead, investigators said the plane reached speeds as low as 103 knots and was in danger of stalling because it was losing lift before it hit the seawall. The pilot told investigators he realized the autothrottle was not engaged just seconds before they hit. Their last second efforts to rev the plane back up and abort the landing failed, although numerous survivors report hearing the engines roar just before impact. Asked if the autothrottle was malfunctioning, Hersman said that is something investigators are looking into as they examine hundreds of parameters of data downloaded from the plane's flight data recorders. An overreliance on automated cockpit systems has figured in dozens of air crashes and incidents in recent years. "Some people, if they believe the autothrottles are engaged and if they are used to flying with the autothrottle engaged, will not realize that the autothrottles are not engaged and will let the plane get pretty slow. That has come up before," said John Cox, an aviation safety consult and former Air Line Pilots Association accident investigator. Hersman said the pilots told investigators they were relying on automated cockpit equipment to control their speed during final approach, but NTSB officials say it is still unknown whether a mistake was made in programming the "autothrottle" or if the equipment malfunctioned. Hersman said the pilot at the controls was only about halfway through his training on the Boeing 777 and was landing that type of aircraft at the San Francisco airport for the first time ever. And the co-pilot was on his first trip as a flight instructor. The plane's airspeed has emerged as a key question mark in the investigation. All aircraft have minimum safe flying speeds that must be maintained or pilots risk a stall, which robs a plane of the lift it needs to stay airborne. Below those speeds, planes become unmaneuverable. Because pilots, not the control tower, are responsible for the approach and landing, former NTSB Chairman James Hall said, the cockpit communications will be key to figuring out what went wrong. "Good communication with the flight crew as well as the flight attendants is something I'm sure they're going to look at closely with this event," he said Tuesday. "Who was making decisions?" Hall was on the transportation board when a Korean Airlines Boeing 747 crashed in Guam in 1997, an accident investigators blamed in part on an authoritarian cockpit culture that made newer pilots reluctant to challenge captains. Since then, the industry has adopted broad training and requirements for crew resource management, a communications system or philosophy airline pilots are taught in part so that pilots who not at the controls feel free to voice any safety concerns or correct any unsafe behavior, even if it means challenging a more senior pilot or saying something that might give offense. If any of the Asiana pilots "saw something out of parameters for a safe landing," they were obligated to speak up, said Cass Howell, an associate dean at the Embry-Riddle Aeronautical University in Daytona Beach, Fla.
"There are dozens and dozens of accidents that were preventable had someone been able to speak up when they should have, but they were reluctant to do so for any number of reasons, including looking stupid or offending the captain," said Howell, a former Marine Corps pilot. First responders gave their accounts Monday of the chaotic scene they encountered when Asiana Airlines Flight 214 crashed at San Francisco International Airport on Saturday. Joe Rosato Jr. reports. There's been no indication, from verbal calls or mechanical issues, that an emergency was ever declared by pilots. Most airlines would require all four pilots to be present for the landing, the time when something is most likely to go wrong, experienced pilots said. Investigators want to nail down exactly what all four Asiana pilots were doing at all times. 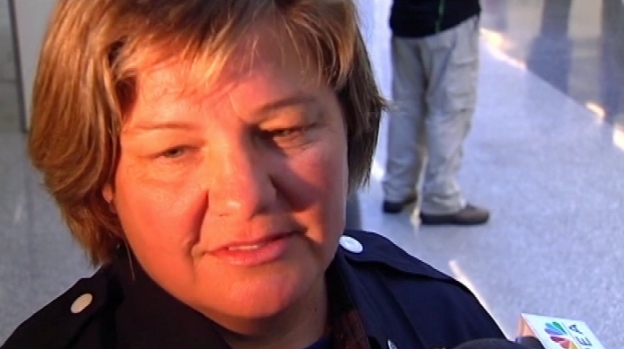 "We're looking at what they were doing, and we want to understand why they were doing it,." Hersman said Monday. "We want to understand what they knew and what they understood." It's unlikely there was a lot of chatter as the plane came in. The Federal Aviation Administration's "sterile cockpit" rules require pilots to refrain from any unnecessary conversation while the plane is below 10,000 feet so that their attention is focused on taking off or landing. What little conversation takes places is supposed to be necessary to safely completing the task at hand. Choi Jeong-ho, a senior official for South Korea's Ministry of Land, Infrastructure and Transport, told reporters in a briefing Tuesday in South Korea that investigators from both countries questioned two of the four Asiana pilots, Lee Gang-guk and Lee Jeong-min, on Monday. They planned to question the other two pilots and air controllers Tuesday. Choi said recorded conversation between the pilots and air controllers at the San Francisco airport would be investigated, too. He said he will look at the efforts of airline employees to help injured passengers and their family members, visit with the NTSB and other organizations to apologize for the crash and try to meet injured passengers. Yoon said he can't meet with the Asiana pilots because no outside contact with them is allowed until the investigation is completed.